1 What is Databack app and How does databack works? 1.1 What are the benefits of Databack app? 1.1.1 How much will data be refunded to you by using Databack? 1.1.1.1 Legit ways to maximize data packs? 1.1.1.1.1 How to use data back app? Do you own a smartphone? If yes! then you might know to use the full features of your Android phone which helps you to connect to the rest of the world with the help of the Internet. Without the internet, a phone is like a bike without wheels. Nowadays, thousands of peoples use the internet from the Android devices because it not only helps us to connect to the rest of the world by just sitting at home, also it entertains us in many ways. But whenever your data pack goes over, how would you fee? Quiet irritating right! But did you ever wondered when you use the internet where this data pack goes? or what if you get refunded the data you spend on surfing the internet? such as Facebook, Whatsapp, UC Browser, E-commerce sites, your favorite websites & apps etc. Well, you heard me right! 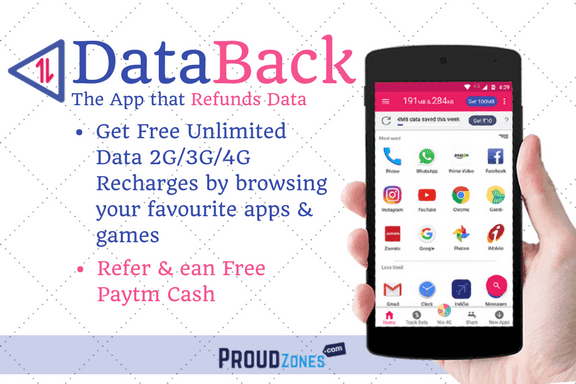 So, let me introduce you to Databack app, this ordinary app helps its users to get refunded your mobile data you spend by using your favorite apps & websites. You can also earn extra mobile data and Paytm cash by inviting friends & participating in contests, which is very simple. What is Databack app and How does databack works? Databack app refunds a part of mobile data that you spend on browsing apps. For example: If you use an app for 10-15 minutes, you may spend around 8MB – 10MB. A part of this data refunded back to you by Databack. Just like the cashback’s that you receive for shopping, similarly at Databack, you get mobile data back. Here’s the introduction video of Databack application. What are the benefits of Databack app? Databack app is very simple & sign up takes only 30 seconds. Just verify your mobile number and it’s done! Use apps already installed on your phone and Databack will refund your mobile data as per the offers. Databack support Mobile data pack recharges for all major operators. Recharge packs work the same way as it from your neighborhood shop. Recharge instantly and use this data to access the mobile internet, as you normally do. Databack does not restrict your data usage to specific apps. Get EXTRA mobile data & Paytm Cash by inviting friends to try Databack app and participating in contests. Recharge up to 2 times in a month from Databack app. How much will data be refunded to you by using Databack? For using a single app you may get data starting from 5MB to 50MB. However, you can get as much as 250- 300 MB data refunded every month by using multiple apps, it depends on how many different offers you avail. You will see data offers on apps that are currently on your phone, once you activate an offer you will start getting the refund as per the details of the offer. Legit ways to maximize data packs? • You get a joining bonus of 5MB. • You can get up to 25-30MB every day by using your favorite apps. • Invite your friends to try Databack app and get unlimited mobile data & Free Paytm Cash. • Participate in daily contests and get bonus mobile data every day. How to use data back app? Every time you start an offer, data gets refunded into your Databack wallet. You can do data recharges once you cross the limit of 150MB data in your wallet. After recharging you can use any internet services on your phone, no restrictions whatsoever. Honestly, it’s just like recharging your prepaid number online. How to redeem data from Databack app? 1. First of all, in order to recharge free data to any number, you have to cross minimum limit if 150MB data in your wallet. Once, you’re done! Open the app & click on recharge now. 2. Now, enter your mobile number, Network name & circle. click on proceed. 3. Now, select any 2G/3G/4G date pack shown in the data pack. (I will be recharging 3G plan 75MB for 30 days). 4. Once again, confirm your data recharge request & click on confirm. 5. Congratulation! your recharge is in process. It can take up to 30 minutes & In case of failure, data will be refunded to you within 24hours. By performing the above steps you can successfully get up to 2 times free data recharge in a month. Databack is the first genuine app ever to offer free data packs you spend on surfing the internet, which is very simple. You can also earn free Paytm cash from databack app by inviting your friends & family members. You will get up to Rs.5 per user sign up’s with your referral link. So, download it today & start earning Paytm money and free data recharges instantly. If you like this post, don’t forget to share it with your friends & family members. Also subscribe us now to receive more interest ways to earn extra Paytm cash. Thank you. found out exactly what I needed. I most indubitably will make certain to do not disregard this site and give it a look on a relentless basis.